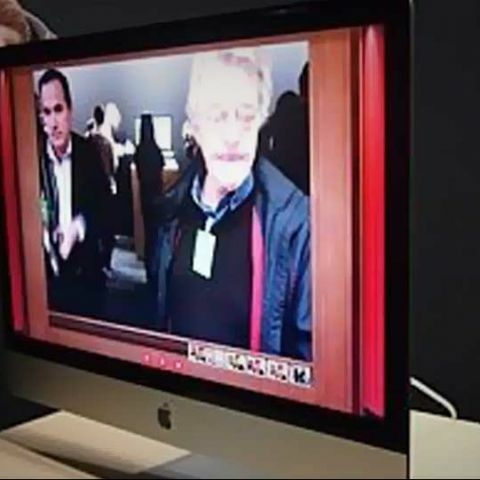 We managed to get some hands-on time with the new Apple iMacs that were introduced on Tuesday. The new iMacs still use a unibody construction, but for all intents and purposes these two models have been thoroughly revamped. 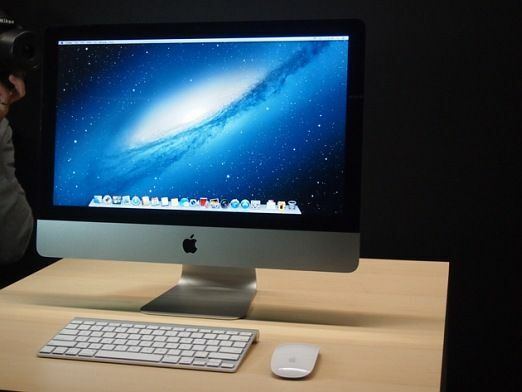 The eighth-generation iMacs have the same silver and glass design as the previous two generations, but now they sport a much slimmer profile since Apple has dropped the optical drive for iMacs. The display measures an incredibly thin 5mm at the edges, though the center of the back panel still bulges out to accommodate the stand, cooling, and the power connector. 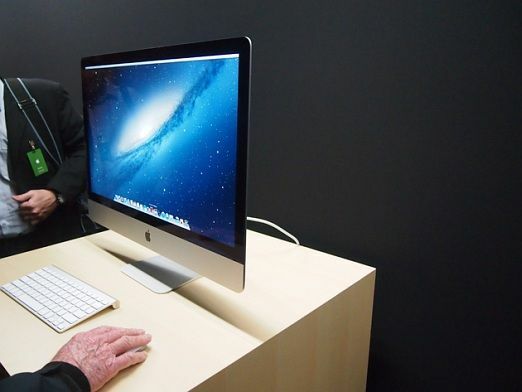 Like previous iterations, the iMacs are built around their 21.5-inch and 27-inch panels. Both feature 1080p HD or better resolution, and In-Plane Switching (IPS) screens, which Apple claims will offer users a 178-degree viewing angle. If you're looking for the input/output ports, you'll have to look in the back. Even the SDXC card reader is now on the back panel, since there's simply no room on the edges of the system. The 27-inch iMac retains memory serviceability, but the 21.5-inch iMac is limited to whatever you configure when you purchase your machine. Thankfully, all new iMacs come with at least 8GB of DDR3 memory. 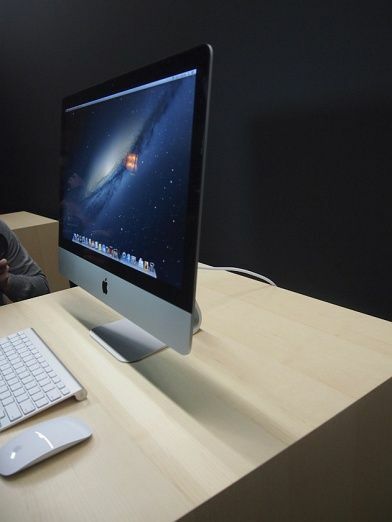 The 21.5-inch iMac tops out at 16GB, while the 27-inch iMac can handle up to 32GB. Processor options include quad-core Intel Core i5 and i7 processors, and all iMacs feature Nvidia Kepler discrete graphics (either the Nvidia GeForce GT 640M or 650M for the 21.5-inch iMac and Nvidia GeForce GTX 660M or 675MX for the 27-inch iMac). While it won't make true graphics die-hards give up their Mac Pros, it will make other users happy to know they can do their work on a powerful system. Storage options include 1TB (on the low end) to 3TB spinning hard drives, up to 768GB of flash storage, and the new Fusion Drive. Like hybrid drives that we've seen on Windows-based PCs, the Fusion Drive uses flash storage (in this case, 128GB) to supplement and speed up access to a 1TB or 3TB spinning hard drive. Unlike a hybrid drive, however, Apple's Fusion Drive doesn't use the flash storage simply as a cache. OS X lives on the flash storage, along with your most used apps and documents. The files are dynamically and intelligently moved on and off of the flash storage by the operating system, depending on how much they are used. In practice, this means the system boots faster, and anything you use daily will pop open quicker, as you'd expect. There are USB 3.0 and Thunderbolt ports for faster file transfers to USB 3.0- or Thunderbolt-equipped external hard drives. We're going to put both iMacs through their paces in the coming weeks, so check back soon for reviews. 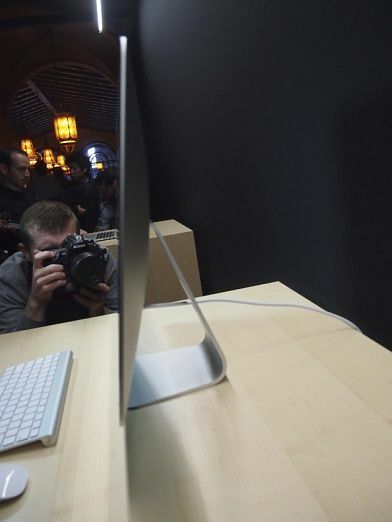 For now the iMac's future looks very thin and bright. 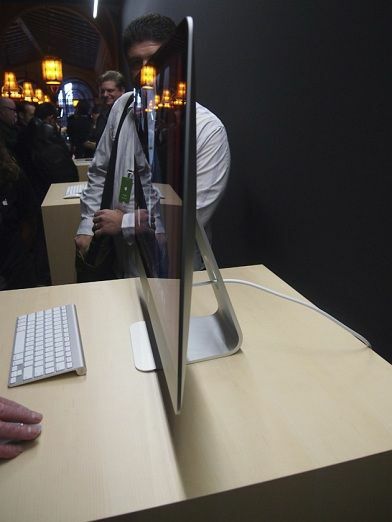 Hands On with the New, Thinner Apple iMacs: Side view - The panel of the iMac measures 5mm thick. Hands On with the New, Thinner Apple iMacs: 21.5-inch iMac display - The iMac 21.5-inch sports a 1,920-by-1,080 resolution screen. Hands On with the New, Thinner Apple iMacs: IPS technology - Apple says that the In-Plane Switching (IPS) panel on both iMac models offers a 178-degree viewing angle. Hands On with the New, Thinner Apple iMacs: iMac 27-inch screen - The iMac 27-inch model has a display with a resolution of 2,560 by 1,440. 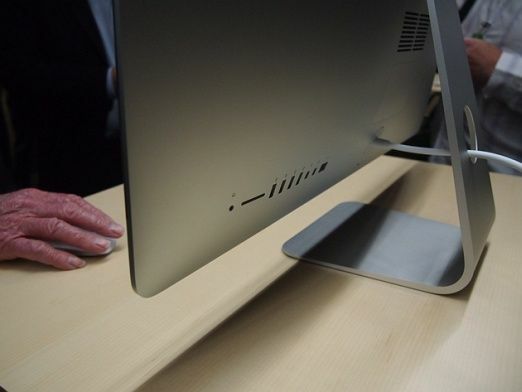 Hands On with the New, Thinner Apple iMacs: I/O ports - The I/O ports on both iMac models have been moved to the back. Hands On with the New, Thinner Apple iMacs: Storage options - Storage options for the iMac include 1TB (on the low end) to 3TB spinning hard drives, up to 768GB of flash storage, and the new Fusion Drive. 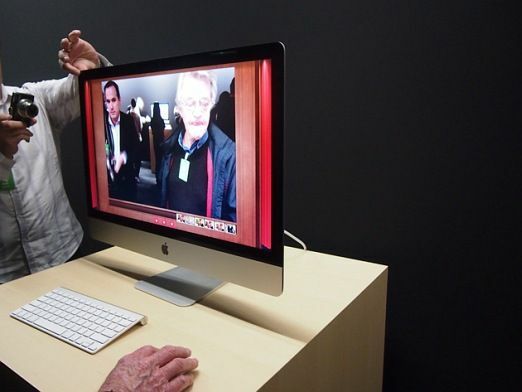 Hands On with the New, Thinner Apple iMacs: Discrete graphics - All iMacs come with Nvidia Kepler discrete graphics (either the Nvidia GeForce GT 640M or 650M for the 21.5-inch iMac and Nvidia GeForce GTX 660M or 675MX for the 27-inch iMac).